The evacuation is complete, and the soldiers who managed to survive are gathering. Misaka has slain the new Aberrant, and rescued their compatriot Eren from within the weak point on the back of its neck. It seems that, despite heavy losses, humanity will continue to survive. Eren, on the other had, has quite a bit of artillery aimed at him. The commander saw what he became, and is terrified of it. Is he man, or is he Titan? Even Eren doesn't know how to answer that question. But Armin has a plan. 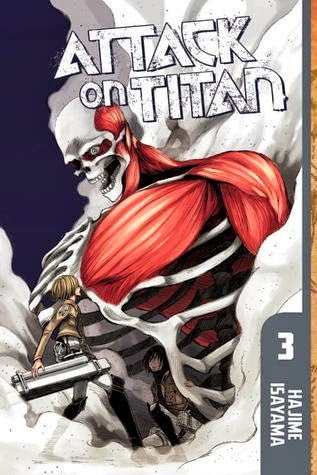 He wants to use Eren in his Titan form to block the hole in the gate left by the Armored Titan. Only a Titan could move the boulder necessary for such a plan, and it would prove Eren is on humanity's side once and for all. They just have to convince the understandably skittish commander that their best shot at reclaiming the wall is to use their greatest enemy itself. Hajime Isayama continues to write an amazing story, slowly introducing us to a cast of characters with depth and motivation behind their actions. Here's hoping that he can keep up the amazing quality of writing throughout the series. Verdict: Another great volume of what critics are calling "Japan's Walking Dead"